1. My Brother Sam is Dead - James Lincoln Collier and Christopher Collier. This 1974 YA novel appears on a lot of banned/challenged lists. I've been looking for it for several years. I wondered briefly how it escaped my notice when it first came out since I was a middle schooler at the time. Then I remembered that that was the year I wasn't reading anything but Gone with the Wind. Ready to make up for lost time! 2. An Arsonist's Guide To Writers' Homes in New England - Brock Clarke. Looks quirky and fun. A nice mixture of literary talk and swears.. Oh, I just noticed that the main character in this book is named Sam. Am I trending? (See above) Is there a BELwether at work? 3. Brother One Cell: An American Coming of Age in South Korea's Prisons - Cullen Thomas. I've been meaning to read this for ages. It's a side of Korea I hope never to see. 4. The Lucifer Effect: Understanding How Good People Turn Evil - Philip Zimbardo. After my journalism dream died and before I realized that I was born to be an English major, I trifled with the idea of majoring in sociology, and have the minor to prove it. Those case studies of group dynamics were as riveting as any novel. 5. The Man Who Loved Books Too Much: The True Story of a Thief, a Detective, and a World of Literary Obsession - Allison Hoover Bartlett. The BEL frowns on loud noises, so I held in my Squeeeeeee! until I got outside. I fell into the closest Starbucks, ordered some tea and cheesecake and read the prologue. So far, the style reminds me of The Orchid Thief, which is good. The Man Who Loved... is bracketed with ancient threats about the consequences of book-stealing. Truthfully, I can see both sides. Interesting end notes, but no index; what's up with that? I still can't believe my good fortune about the BEL. Sometimes, between visits, I am compelled to take the virtual tour. Why? I start to think it can't possibly exist and I just dreamed it and when I wake, I'll be back at my first university where all the nonfiction books (English and Korean) stop at Dewey Decimal number 799, and there is no fiction section. From the pits to the sublime in a little less than ten years. I'll be very interested to know what you think of The Man Who Loved Books too Much! Brother One Cell sounds interesting! I may have to add it to my tbr list. Happy reading. 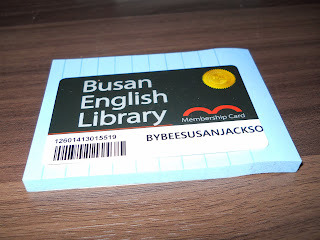 I so wish we had an English library in Daejeon! And here's my Christmas Wish for you - that Mary Poppins is only hiding slid out of sight in the stacks and she is soon found and ready for you to read very soon!